You wouldn't go to a sushi restaurant and complain the food is raw. Same goes for improvising. You’re dealing with a raw idea; unfiltered, unprocessed. It’s not like any other type of singing. If you are scared when improvising, you’re probably looking at it the wrong way! Appreciate it for what it is, not what it’s not. 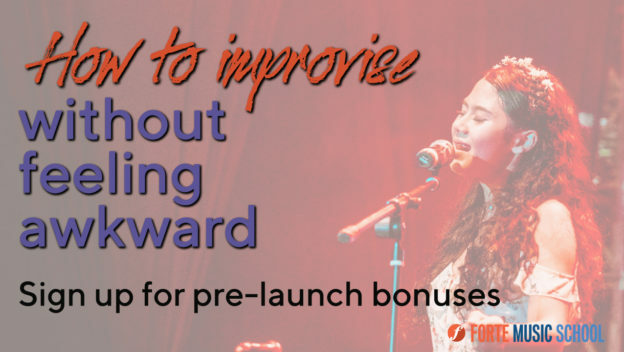 In our blog post, we have some great action steps to help you feel less ick when you want to improvise. A lot of the problems are with attitude and mindset: the other things you can improve by deliberately restricting your choices and building from there. Like the sound of this..? Free extra bonuses to anyone who joins before the launch of the blog post. The blog post launches in a few days. Do your friends stuggle with improvising?